Version "MetaTexis NET/Office" offers great flexibility regarding the sources used as TMs and TDBs. You can not only use different database engines, but you can also connect to the MetaTexis Server, TinyTM or MyMemory via LAN/Internet. And you can use the TRADOS Workbench. 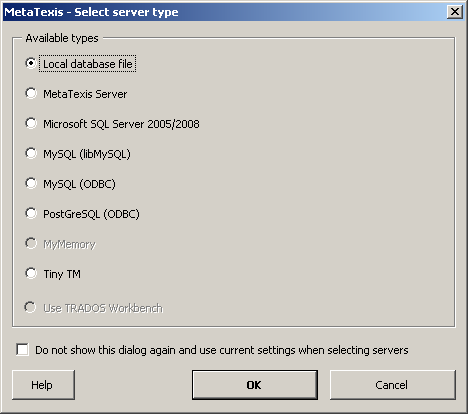 When you select this option and click OK, you can select a locally saved MetaTexis database. This is the correct option for selecting databases of SQLite and MS Access databases (Note that the old edb engine is still supported although you cannot create new edb databases anymore, see above). To connect to a MetaTexis Server, select this option and click OK. In the dialog shown, enter the server and logon data as provided by the server administrator. To save, click OK. For detailed instructions, see the Setup server connection. 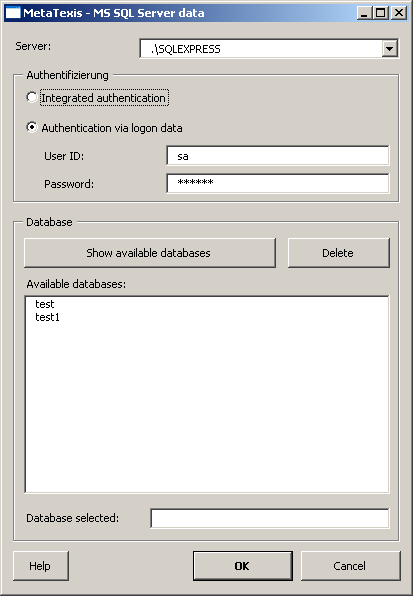 After correct access data, you have access to the MS SQL Server engine (but only the relevant databases are displayed, that is only MetaTexis TMs or MetaTexis TDBs). When you click the Show available databases button, the list of available MS SQL Server TMs/TDBs in the listbox below is refreshed. To select a database, double-click one item in the list of available databases, or select one item and click OK.
To delete a database, select one item in the list of available databases and click the Delete button. The Port is detected automatically, but you can change it manually (only recommended for experts). 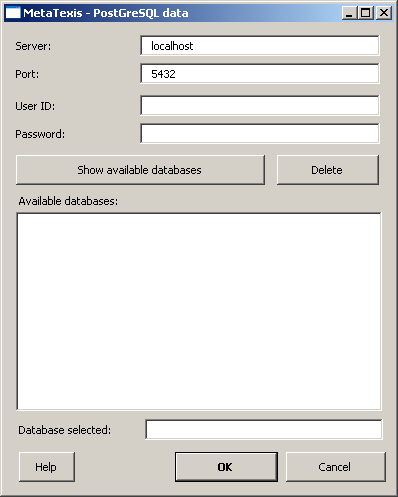 After entering a correct combination of user ID and password, you have access to the MySQL engine (but only the relevant databases are displayed, that is only MetaTexis TMs or MetaTexis TDBs). When you click the Show available databases button, the list of available MySQL TMs/TDBs in the listbox below is refreshed. After entering a correct combination of user ID and password, you have access to the PostGreSQL databases (but only the relevant databases are displayed, that is only MetaTexis TMs or MetaTexis TDBs). When you click the Show available databases button, the list of available PostGreSQL TMs/TDBs in the listbox below is refreshed. The MyMemory access is only available for secondary TMs because MyMemory is currently only available for searching. For more information see: http://mymemory.translated.net. To be able to use the TinyTM you will have to register at TinyTM.org first, then use the user ID and password for loggin on. For more information see: http://www.tinytm.org. If you run TRADOS Workbench on your system, you can access it through MetaTexis. This way, you run both MetaTexis and TRADOS on one computer and use the same TM. If this checkbox is active, the dialog box will not be shown when you select TMs or TDBs, and the last settings saved will be used. If the checkbox is not checked, the dialog is shown each time you click the Select button in the Document options or the Start Assistant.